It’s Friday and the weather’s good! What more can you ask for? 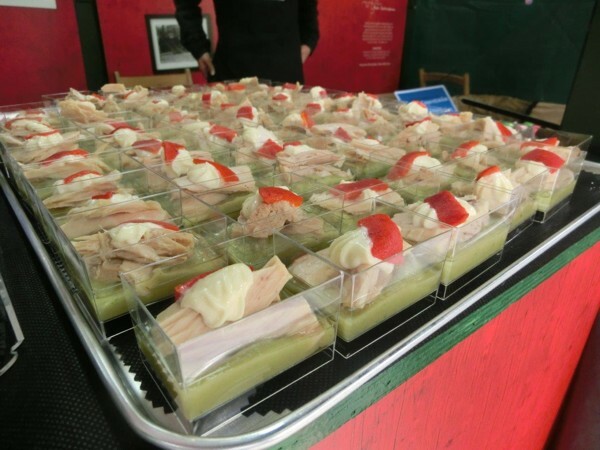 Well, maybe, now that you ask… some nice pintxos! Wish granted! After last week’s tartar sandwich with anchovies, today we have another of the delicious pintxos that Lanbide Hastapena made for our stand at the Arrain Azoka: a delicious guacamole pintxo with White Tuna. Blend the ripe avocado with the blanched spring onion, the peeled and seedless tomato, tabasco, vinegar and salt. (*If we want the guacamole to last longer without oxidising, add a spoonful of mayonnaise before blending everything). If you like it lighter, thin it with some water. Put the guacamole in small individual containers. Add a piece of White Tuna on each little cup of guacamole. If you want, you can decorate with some mayonnaise and a strip of roasted red pepper. A great combination! Thank you very much for your cooperation!